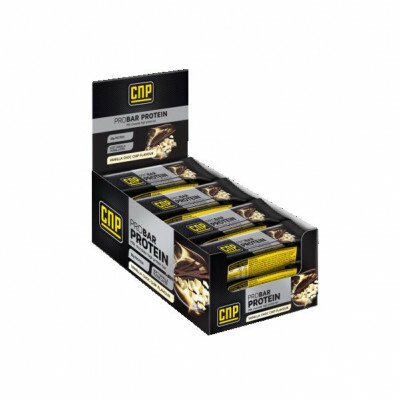 The CNP Professional Pro Bar Protein is a great way to add Protein to your diet. Sourced from Whey Protein Concentrate and milk protein isolate, Protein contributes to a growth in and maintenance of muscle mass. It also supports normal bones. This protein bar has a fudge layer, real chocolate coating and is available in several flavours. These tasty bars are suitable for anytime of the day. CNP Pro Bar Protein can be combined with CNP Pro Peptide protein shake to increase Protein intake further. Please note that nutritional information is a guide only. Nutritional breakdown for individual products may vary slightly. Pro Bar Protein is ideal any time of day to support your training and diet. Pro Bar Protein are particularly beneficial as a post workout snack or to keep you fuelled on the go. Caution: Keep out of reach of children. Use as required. Please note that excessive daily intake may lead to stomach upset.